ShinyLoot knows that you don't need a co-op partner on Valentine's Day to have a fun time. Valentine's Day is almost here, which means couples are buying over-priced cards and flowers while single folks become acutely aware of the fact that they're single. 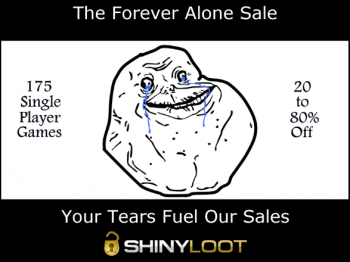 But fear not, lonely gamers: indie digital distributor ShinyLoot has some deals just for you! The tactfully-named "Forever Alone Sale" is offering discounts on over 170 single-player games to keep you company this week. A third of the ShinyLoot library features discounts up to 80% off for the next few days, with each game at its best in single-player. "All you need is a mouse, a keyboard, and your personal computer to warm that bitter heart," the site assures. A big-discount deal will be offered every day to complement the week-long sales, up through February 16. ShinyLoot is an indie-focused digital distribution site, dedicated to offering exposure to obscure indie titles. The site also has a firm stance against DRM, which has earned some respect from both customers and developers.